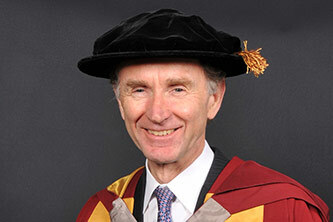 Lord Green was given an Award of Doctor of Science honoris causa by City in 2011. The Rt. Hon. The Lord Green of Hurstpierpoint is a Conservative member of the House of Lords. Lord Green was appointed to his current post as Minister of State for Trade and Investment, an unpaid and unelected position, on 11 January 2011. He was previously Group Chief Executive (2003-2006) and then Group Chairman (2006-2010) of HSBC Group. It has been announced that Lord Green will retire from the government in December 2013. In 1977, Lord Green joined McKinsey & Co Inc., a firm of management consultants, for whom he undertook a number of assignments in Europe, North America and the Middle East. He joined The Hong Kong and Shanghai Banking Corporation Ltd in 1982 and was responsible for corporate planning. In 1985 he was put in charge of the development of the bank's global treasury operations, until, in 1992, he was promoted to the position of Group Treasurer of HSBC Holdings plc, with responsibility for the HSBC Group's treasury and capital markets globally. He was appointed to the Board of HSBC Holdings plc as the Executive Director for Investment Banking and Markets and assumed additional responsibility for the Group's corporate banking business in May 2002. Lord Green was then made Group Chief Executive in 2003 and Group Chairman in 2006, as well as a director of HSBC Bank plc, The Hong Kong and Shanghai Banking Corporation Ltd and of HSBC North America Holdings Inc. He became the Chairman of the British Bankers' Association in 2006. In September 2010 it was announced that Lord Green, then Stephen Green, would join the government as the Minister of State for Trade and Investment. In order to make him accountable to Parliament he was created a life peer on 16 November 2010 as Stephen Green, Baron Green of Hurstpierpoint and was introduced to the House of Lords on 22 November of the same year. He became Minister of State for Trade and Investment in both the Department for Business, Innovation and Skills and the Foreign and Commonwealth Office on 11 January 2011. Lord Green is also an ordained Anglican minister and is the author of several books on morality. In addition to his Award of Doctor of Science honoris causa from City, Lord Green received a bachelor's degree from the University of Oxford and a master's degree from MIT in the USA.